There are men’s conferences and there are men’s conferences. This is the latter! This is a God-honoring, Christ-centered, Spirit-led men’s conference for men who want to go deeper, grow stronger, and be challenged by the Word of God. “My son and I attended the Iron Sharpens Iron men’s conference this past March in O’Fallon, IL, where we met you and attended your seminar. As a pastor, I was leading a group of men to the conference, but my real concern was my 18-year-old son who has had some tough challenges in the past year. He has wavered in his faith—questioning what and why he believed. This also spilled over into some poor choices and bad relationships in his life. “Your seminar was exactly what my son needed! Your dynamic personality and engaging presentation of the Gospel totally connected with my son. He laughed, took notes, and was challenged that the Christian faith was intellectually credible in the secular arena of life! “He so loved your seminar he wanted me to buy all the resources available (which I happily did!). Since that time, there has been a dramatic change in his life. Unhealthy relationships have been severed and he has a renewed joy and commitment for Christ. I thank God for this timely and sovereign appointment for my son and your ministry. Thank you for being the choice instrument that God used in his life.” Praise the Lord!!! This is not your typical “cowboy up and do better next time” men’s conference. Speaking the truth in love, often times “men’s conferences” and “youth rallies” are little more than pep-rallies, and have little or no power for real life–change. By God’s grace, we avoid the trap of the man-centered, works righteousness. Our focus is on not just the love of God but the holiness of God. Another one of our flagship messages is entitled the power of God from Sinai to the cross. Many have said this was the most powerful message they have ever heard! In this message, we do not shun to teach the whole counsel of God. We have received e-mails, letters and phone calls from men sharing their testimonies of how God used this message to deliver them from the fear of man to give God His rightful place as Lord in their lives. The impact this ministry has sustained in the lives of men and young people has been extremely encouraging. Many have come out of the closet of fear, and are learning to live lives of lion-hearted boldness for Jesus Christ! When you’re right about God and you’re right with God, you never have to be intimidated by the world, the flesh, or the devil himself, and it’s okay to get excited about Jesus! —Todd Greiner, Senior pastor of Community of Faith Church for over 20 years and founder of Church Without Walls in Southern Illinois. Philip DelRe has been teaching in men’s conferences and youth rallies across the country and around the world for the last 20 years. His clear, direct, passionate, no-nonsense approach to teaching the whole counsel of God is filled with illustrations and real-life stories that really connect with people. Our passion is to teach God’s people to know why we believe what we believe. This builds a solid foundation for living the Christian life in a non-Christian world. 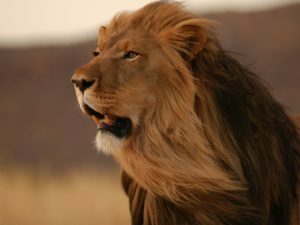 If you would like to see the men in your congregation or youth group take a giant step in learning how to live the Christian life with the confidence of a lion, this ministry is right for you. Phil has been privileged to speak at hundreds of churches across the country and around the world. He is an annual presenter at many of the Iron Sharpens Iron men’s conferences as well as Districts, a huge youth rally in Green Bay.